This past weekend I raced down in Salem, UT with my whole BAM fam and a huge group of SLTC members! It was so much fun to be able to race with my coach and teammates. I won female overall and set a new female course record by about 7 minutes! To make it even better!! My sweet mama and grandma came and volunteered. They did some beautiful body marking pre race and then helped to keep the watermelon and chocolate milk stocked up for all the hungry athletes crossing the finish line. The best part was having my mom give me my finisher’s medal. She is my biggest fan and my best friend, it really meant a lot that she was waiting for me at the finish line. 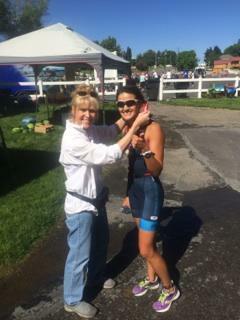 This was such a fun race, the organizing group Race Tri really does a great job here in Utah. Once I was up on the podium they gave me a medal with my place, and then a gold plate, and then a TIARA AND A WAND crowing me Princess of Salem. Then I had the privilege of soaking anyone unfortunate to be standing too close with a bottle of Martinelli’s Sparkling Apple Cider (I’m told it was a great year 😉 ). Triathlete version of the Sistine Chapel, high fiving a teammate before I cross the finish line. Chillin’ in the shade post race. Thank you to all of the wonderful people who continue to sponsor and support me here in Utah. Thanks to Precision Bike Fit for making sure that I was comfortable and powerful on my bike. My strength coach Brett Rosen who does a great job in helping me work on imbalances so I can train even harder. Dr. Tom Fletcher of Wasatch Health Solutions for helping keep me aligned and injury free. Core Power for making an amazing product and helping me recover after every workout and race. Last but certainly not least my awesome Coach Wesley Johnson of Balanced Art Multisport who after my mom is probably my second biggest fan, it is so critical to have a coach that believes in you and your potential. I would also like to announce a new sponsor…Josh King of Lostris Massage! He is the best in the business for Sports massage! With all the stress I put my body through it is essential to have a great massage therapist. Josh is very knowledgeable in his field and does continuing education to remain the best. I highly recommend him if you are an athlete looking for the very best method of recovery, or just need to relax from the stresses of life. He is already working with many of the BAM and SLTC athletes in the area. So don’t wait to make an appointment with him! As of last Friday I have also added an additional race to my schedule. I am venturing into the world of 70.3’s!! Baby steps though, I will be swimming and running and another one of my coach’s athletes will be biking. You can track us next weekend at Boise 70.3, just follow the BAM Girls!! Hey do not forget Gary and myself in the pecking order………we are big fans of the Z………and I would have named you QUEEN !!!! !